- New CAD formats versions are supported: Inventor 2019, IFC 4 add1, Creo Parametric 5.0 and Revit 2019. 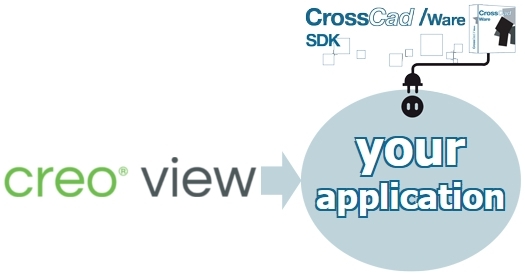 - A Creo View format reader is now available in CrossCad/Ware SDK, thus completing the Creo Parametric format reading, already provided by Datakit for many years. This new reader enables software vendors to add CreoView import capabilities to their own application by using Datakit’s API. They can thus extract geometry (mesh), assemblies, colors and meta data (mass, volume, materials…) contained in Creo View files (.ol, .ed, .edz, .pvs and .pvz files). Datakit tools remain completely independent and don’t require any third-party license.